absolutely gorgeous when you see them up close with the iridescent greens/blues/purples in their tails as well as the very striking white on black markings. Their numbers have increased by 112% over the last 30 years and they are now the 13th most commonly seen bird in British gardens. However, their challenging, almost arrogant attitude, that has won them few friends. But they are beautiful striking birds. They are scavengers and collect objects, with a weakness for shiny things. Magpies usually walk, but can also hop quickly sideways with wings slightly opened. Watching them hop along curiously looking around for things is a fun way to while away a few minutes on a nice day. I'm never sure if they are looking for shiny things or just food, but that is part of the enjoyment of watching them. 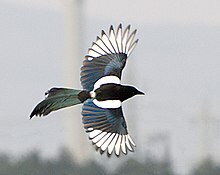 The black and white Eurasian Magpie is one of the few animal species known to be able to recognize itself in a mirror. In Britain and Ireland a widespread traditional rhyme recounts the myth that seeing magpies predicts the future, depending on how many are seen. Whenever a Britisher sees a single magpie the tradition is to say "Good morning Mr. Magpie. How is your lady wife today?" As magpies usually mate for life seeing one on its own is as sign of sorrow because it's lost it's mate, whereas if you see two it's is a sign of joy as it's with it's mate. This is why when you see a single magpie you ask after it's wife, thus suggesting it has a mate and is in fact happy. Labels: Birds, Magpie rhyme, Magpies, Saluting Magpies.